At 11.37 on 14 August, a stretch of about 200 meters of the Morandi bridge collapsed on the A10 Genoa / Ventimiglia motorway that crosses the residential areas of the city of Genoa. The collapse of the Morandi Bridge led to the death of 43 people, injured dozens of people, including many seriously. 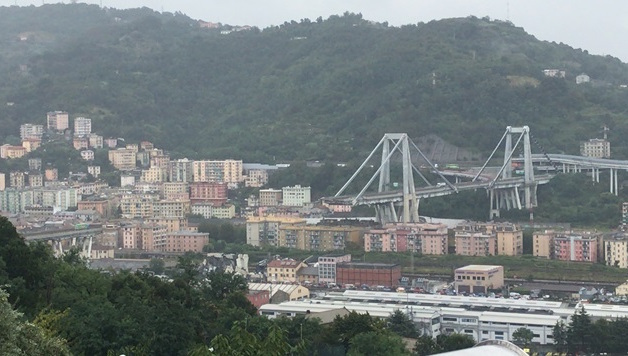 The risk that another section of the bridge could collapse forced the Genoa municipality and the civil protection to demand the immediate eviction of homes in the zone of via Fillak. Currently over 600 people have been displaced. To give an idea of the emotional dimensions of the tragedy: annually an average of 25 million cars travelled on that stretch of highway. It is a colossal bridge, opened as a symbol of Italy’s boom in 1967. The bridge was the main link between Genoa and western Liguria, in a city notoriously closed in between the sea and the Alps. The nearby Polcevera viaduct was also the main transit point to and from France. All the Genoese, and many others, have crossed the Morandi bridge several times. This immense tragedy left an entire city and an entire country in shock. Immense solidarity has arrived to the victims from all over Genoa and throughout Italy. For example, the municipality of Naples canceled the mid-August seafront festivities in solidarity with the victims. There are rising rumors that the start of the football season might slip. Each of us wonders how it is possible, in a country where the bridges and aqueducts built two millennia ago by the ancient Romans are still standing, that such an imposing structure, designed to last for centuries, may fall from one moment to another. On the day of the funeral of the victims, while still digging in the rubble, Resistenze Internazionali intends to first join in solidarity with the relatives and friends of the victims of this tragedy that has involved mainly workers. Among the established dead there are road hauliers, employees of municipal companies of AMIU (among them a young worker who had a short-term contract) and ASTER, as well as young people and families who were going to the beach. This massacre could and should have been avoided. The collapse of the Morandi bridge and its disastrous consequences on the lives of hundreds of people have as their sole cause the thirst for profit of the private sector and the criminal policies of privatization of the Italian motorway network. They have allowed private citizens and specifically the criminal Benetton family, one of the worst of Italian capitalism, to put its mark on the entire Italian motorway network. We want to say it clearly, the collapse of the Morandi bridge is not the result of some unpredictable and imponderable event. The bridge did not collapse due to a “water bomb” or because it was struck by lightning but due to a precise political choice; to entrust the management of the Italian motorway network in the hands of the private sector. A private sector that hides its interests and responsibilities through a system of holding companies and subsidiaries that are protected by laws written specifically for them. The privatization of the Italian motorway network was carried out by the so-called ‘centre-left’ government of Massimo D’Alema in 1999. However, to be honest, we must recognise that the privatization frenzy began in the 1980s and was conducted both by the ‘center right’ and from the ‘center-left’ over the last twenty years with its peak when the ‘center-left’ was in government. With that privatization policy, the state granted a concession on the 6,500 km of motorways to private interests who, in exchange for the payment of a symbolic annual fee, have pocketed dizzying figures through tolls without investing in maintenance. Maintenance costs are in open contradiction with the individual capitalists’ cardinal principle in their capitalist economy: the maximization of profit at any cost, even when this goes against the general interests of society. In 2000, the Benetton family seized control of the largest concessionary company, Autostrade per l’Italia, which manages most of the motorway network, including the stretch of the Morandi bridge. Autostrade per l’Italia, which manages the entire national motorway network is today controlled by Atlantia SpA., a holding company 30% controlled by the Benetton family. Atlantia manages and controls motorways and airports all over the world with investments worth billions of dollars in India, Brazil, France and, since 2018, also in Spain thanks to the purchase of shares in Abertis Infraestructuras, which manages tolls on Spanish motorways. This giant gathered, in 2018 alone, revenues of €1.7 billion simply through tolls, so it is not really a company in crisis. As is well known, the Benetton family, which is the majority shareholder in Atlantia, has investments and holdings in various sectors and does not hold back from anything to maximize their profit. The link between this family and the Bangladeshi companies for whom the victims of the April 2013 Rana Plaza tragedy in Dhaka were working when an eight-story building collapsed, killing over a thousand textile workers, has been demonstrated. In Argentina the same family is involved in the privatization of agricultural land in Patagonia and in the 2017 “disappearance” of the Mapuche activist Santiago Maldonado who had been fighting for the defense of his land. Responding to the rumors that its concession for the management of motorways could be revoked (which would normally last until 2042), the company stated that it considered such rumors as unjustified attacks, underlining that in case of revocation it will demand payment of the remaining value of the concession , which at a first estimate would amount to €20 billion. In short, we are dealing with a family of cynical capitalists, rapacious and thirsty for profit. But the problem is not the Benettons but a system that entrusts them the private management of infrastructure, a system that privatizes the gains and socializes the losses. Today on Saturday 18 August the state funeral was held for the victims of the tragedy. Many families refused to participate in the state funeral. One mother of one of the victims denounced the “catwalk of politicians” coming to the disaster site. Another victim’s mother said: “The state has caused all this and there has been a shameful political gangway: they must not allow themselves to be seen”. The father of another of the dead boys wrote on Facebook “We do not want a funeral farce, but a ceremony at home, in our church in Torre del Greco. It’s a private pain, you do not need catwalks. From today begins our war for justice, for the truth: it must not happen anymore”. The fact that so many families rejected the state funeral is an extremely significant fact and demonstrates the abyss that exists between ordinary citizens, institutions and the political elite considered responsible for this tragedy. The state funeral took place in a surreal atmosphere, the whole city seemed asleep with shops and restaurants that closed in mourning and respect for the victims. The highest offices of the state took part in the ceremony. There were the President of the republic Sergio Mattarella, the Premier Giuseppe Conte and the Vice Premiers Salvini and Di Maio. Journalists and regime planners have spoken of applause for government representatives. In fact, the applause was addressed to the fire-fighters, to the men and women of civil protection and to the health workers who have been working for days in the ruins of the Morandi bridge. If it is true that there was not any particular hostility shown to the government politicians, this due to their promise that they will “implement justice” and the decision taken by the Minister of Infrastructures, Toninelli, to initiate procedures for the removal of the state concession of Italian motorways to the Atlantia group. This sentiment speaks to us of the strength of the anti-establishment sentiment, channeled towards a government to which many ordinary people at this moment, delegate their expectations of revenge. Having said that, the distance between the words of the government representatives and the real solidarity from below of tens of thousands of thousands of Genoese citizens in solidarity with the victims, was palpable. The collapse has put the main political parties in difficulty. For example, the M5S had to delete the articles on their own media in which they wrote of the “fairy tale” of the possible collapse of the Morandi bridge. At the same time, it emerged that the Benettons financed the electoral campaigns of both the previously ruling Democratic Party and the right wing Lega led by Salvini, currently both Deputy Prime Minister and Interior Minister. The present Premier, Conte, when previously working as a lawyer was been a legal advisor to Aiscat, the Italian association of motorways and tunnels, and of the A4 Brescia-Padova, whose interests he took care of. Despite this, under the weight of public pressure, the same Conte said that we could witness the cancellation of the concession of the motorways to the group that currently manages them. The revoking of the concession to the group is already overdue. But playing within the rules of the capitalist economy, however, risks the state having to pay a ‘penalty’ for cancelling the concession, and paradoxically, risks further enriching the owners of the concession. In addition, lifting the control of motorways by a large capitalist group to put it in the hands of another will not solve the problem of maintenance, expensive tolls and private profit. A recent survey done shortly after the tragedy showed that 81% of Italians are in favor of the renationalisation of motorways. This is the way to go! It is necessary to renationalise the entire motorway network as soon as possible, to tear it from the clutches of private individuals and immediately proceed with the checking and maintenance of all infrastructures starting from the reinforced concrete ones built in the 1960s. But to avoid that the costs of nationalization fall on ordinary people, perhaps in the form of further increases in tolls, it is essential that these are made without any form of compensation for the old operators of the motorway network. However, legitimate criticism of privatisation and the Benetton group must not stand in the way of seeing how this disaster is also linked to the long term crisis of capitalism in Italy and the austerity policies of the last decades. Investment in Italian roads has fallen from about €14 billion in 2007 to €5 billion in 2015. The Morandi Bridge is the 12th Italian bridge to have collapsed since 2004. In an attempt to channel popular anger against the collapse of the bridge against the European Union, Matteo Salvini, leader of the right wing Lega, Deputy Prime Minister and Interior Minister, said that this collapse was due to the austerity policies desired by Brussels. Matteo Salvini’s clumsy and crude attempt to use the popular anger that exists in Italian society against the European Union serves on the one hand to mask the direct and indirect responsibility of his party and his government in this collapse. On the other hand, it serves to divert attention from those really responsible and try to change the target of popular anger to avoid facing the issues of state concessions, privatizations and renationalisation of motorways. This attempt must be immediately rejected. We do not accept exploitation and media profiteering on the part of an interior minister who, on the evening of the tragedy, did not visit the city but partied with his Sicilian cronies. It is not accidental that Salvini, not willing to or knowing how to seriously comment on the incident, continues to publish interviews against migrants. On the day of the state funeral, he took selfies with supporters during the ceremony. We must reject the nationalist attempts of Matteo Salvini, to deflect criticism away from capitalism itself and from the Italian ruling class by simply blaming the austerity policies often demanded by the European Union (EU). The EU has forced austerity policies on many countries, but on its own a break with the EU and its policies will not produce fundamental change. Only a structural break with capitalism and the laws that regulate its functioning will be able to prevent similar tragedies in the future. A socialist society, based on the power and the self-organization of workers and ordinary people, would not only allocate resources to the maintenance and control of infrastructures but would choose to build bridges, roads and highways using the criterion of usefulness, social benefit and ecological impact and not that of short-term profit. This is the perspective for which Resistenze Internazionali (CWI in Italy) is fighting. The renationalisation, without compensation of companies like Atlantia, of the Italian motorway network and for it to be put under control and management of workers in the sector and their representatives, with the necessary state funding, as part of a comprehensive transport plan.